This post was originally written 8 years ago, when most of my kids were still living at home. I never posted a photo of this syrup because it was always eaten up before I had a chance to get out the camera! One day, after a neighborhood breakfast, my kids came home RAVING about Kristen’s Special Syrup. Could SYRUP be that good, I thought?? No mention of pancakes, or waffles… just the syrup. I called my friend Kristen and she gladly shared the recipe with me. Guess what? It’s called syrup, but tastes like caramel sauce! No wonder they loved it. Kristen’s syrup is not your typical run-of-the mill thin maple flavored syrup. Her syrup reminds me more of a light caramel sauce you’d use on ice cream. Our family loves this syrup on waffles and pancakes. I also love using it to top bread pudding or overnight french toast dishes. 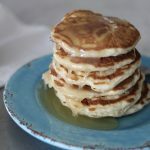 It has become a tradition in our family to have this syrup on Conference weekends, Easter, Christmas and other gatherings where we typically make a special breakfast spread. This syrup should come with a warning. Warning: Once you make this, your family will expect it. Every. Time. You. Make. Pancakes. Kristen’s Special Syrup is made with light Karo Syrup, whipping cream and sugar. 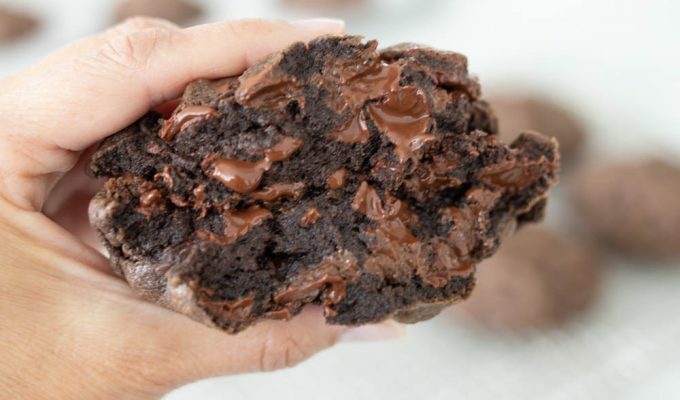 I know, not low calorie, but one taste and you’ll agree it’s worth every bite. 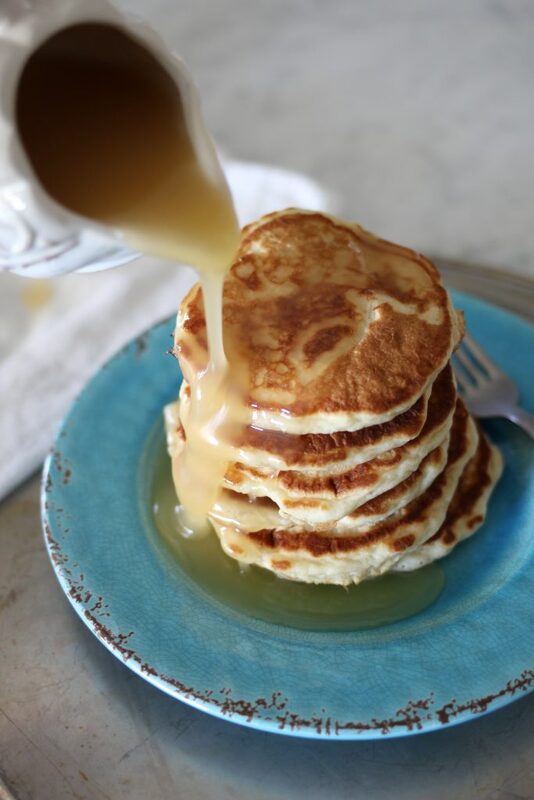 It looks decadent, which usually means complicated, but this syrup takes a minute to throw in a saucepan, whisk and then just a few minutes of boiling. Kristen told me she always makes extra so a jar is chilling in her fridge at all times. 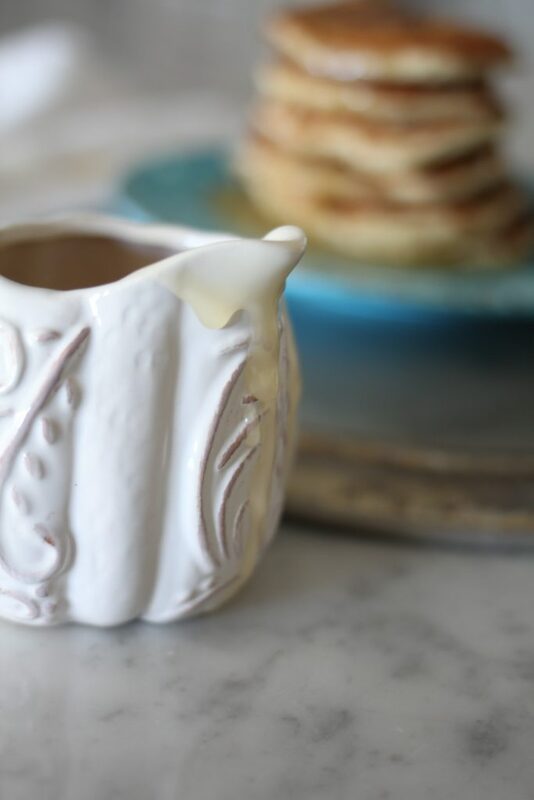 It’s easy to heat up and pour when you want to top your pancakes with something extra special. I know you’re going to love this as much as we do! Pour ingredients into saucepan. Whisk together. Boil for 5-10 minutes on medium high heat, stirring while mixture is boiling. I usually boil for 5 minutes. Serve warm. Store leftovers in refrigerator. Tips:-Make sure to use a pan that is at least 6-8 cup capacity, the syrup will bubble up, and it's best to use a larger pan so it won't boil over the edge. Hi I’m Corrine’s friend. I LOVE your blog. Every post makes my mouth watter! I am so glad you have a blog. I love it! I especially like the personal stories with the recipes. Keep it up and thanks!! You are a good cooker and a good writer. Keep it up…I may be dieting, but I can read the recipes and imagine the food in mouth and not on my hips. Kristen, I don’t know who you are but I’m pretty sure my kids love you more than me now. I made this syrup to be paired with Si’s fabulous buttermilk aebleskivers on conference morning and this combination was a match made in heaven. So easy and delicious!